A series of monographic issues in digital format will bring together, through key words inspired by current affairs, the great patrimony of the contents and reflections that the Review has accumulated over the years. 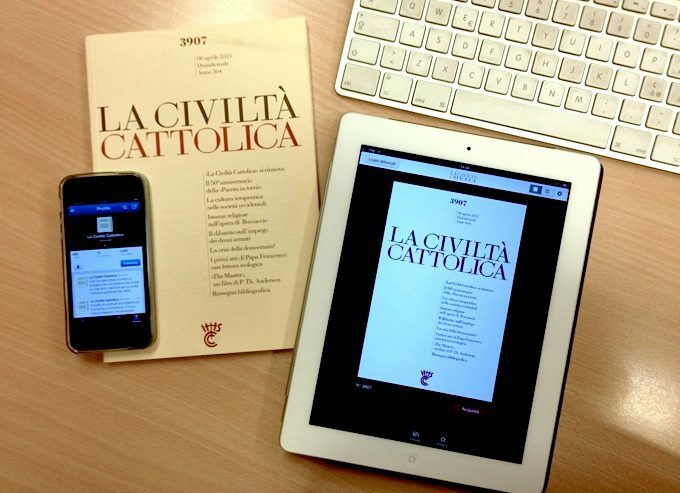 “La Civilta Cattolica” has launched a new series of digital monographs, entitled “Accents.” It will bring together, in a thematic way, its recent and remote reflections, putting the “accent” on a current topic or a “key word.” The series will be a way of assessing the great patrimony that “La Civilta Cattolica” has accumulated from 1850 to today. The volumes will be available free for our subscribers on our applications for tablet and smartphone; they can be acquired and downloaded by all — from 12:30 pm in PDF format on the site www.laciviltacattolica.it and in paper format on Amazon. We attach the volume to this e-mail available to the press. The first Accent: Korea 10 days from the meeting between Moon and Kim. The Korean Peninsula is at the center of international attention. This land, so rich in harmonies and tensions, has become today the point of fracture and suturing of blocs: it is not only a strip of Oriental land, but a global political quadrant in which precarious international balances are at stake. That is why we have dedicated the first volume to the Korean Peninsula. The third summit between South Korean President Moon Jae-in and the North Korean leader Kim Jong-un is scheduled for April 27, 2018. To prepare itself for these developments “La Civilta Cattolica” — thanks also to local qualified voices –proposes reflections, from a very recent or distant past, creating connections and unveiling roots and motivations, to help one understand what is happening today and what can happen in the future. It is in these days, among other things, that Kim Ki-duk’s new film “The Korean Prisoner,” has opened in Italian movie houses. In the last section – “Inside the Culture” – of the first volume of “Accents,” we also suggest again a reading of the three previous works of the film director. The first issue of “Accents” is on sale – for non-subscribers – at the promotional price of one euro.